This little Eared Willow was covered with brown aphids. The ants were busily running up and down - presumably milking them for their 'nectar'. Devilsbit Scabious usually appears as shown in the left image, but a few specimens put up flowers that are colour-reversed. Two shots of a mature Gorse seedpod. The one on the RHS has been eaten, presumably by a micromoth larva. The fungi are really starting, now. This is Hebeloma mesophaeum. Poisonous. Scutellinia scutellata is a tiny (5mm) fungus that grows on damp ground. Its common name is Eyelash Fungus, and the black eyelashes will appear round the rim shortly. Four shots showing the end of a micromoth - possibly Agriphila straminella. It crashed into the spider's web and there was a flurry of frenzied activity with only one possible outcome. Notice how the moth becomes progressively 'neater' as the binding takes place. Two nice seedheads. Selfheal on the left and Tormentil on the right. 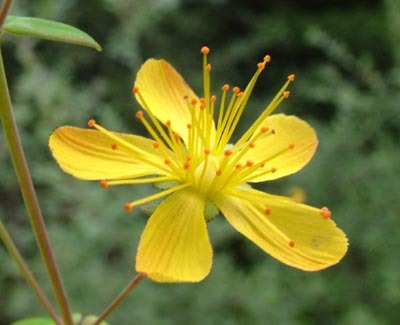 Why did I take this picture of the Slender St. John's Wort?